Information and communication technology are phenomenal and the beginning of the emergence of a web application is the Internet. Internet which originated from research to defense and security as well as educational support tool business evolved into a very influential. This is also encouraging PT. Batam Bintan Telekomunikasi (BBT) to provide internet services facility adalahwifi named one wifi BBZON (Batam Bintan Zone, Overlaight Network). Customers who have signed up to become a member BBZON, they can do anything, including transaction log, monthly payments, etc. can provide advice through the website which has disedian by BBT own party, which is located in WWW.BBZON.COM. Wifi and BBZON website is intended for residents dormitori particular employees or customers. With the technology services and website BBZON wifi, can solve the problems facing employees who live in dormitori especially for those who work while studying or courses, ranging from speed internet access, a mechanism or procedure payment processing Internet packets among customers with the BBT, login quickly and easily. But in fact BBZON website wifi and still have weaknesses as well as obstacles in it. It began when at the turn of 2013, there are some links that can not access the next link page in which there is information we want to know when we click the link on the login page either wifi or on the web page itself BBZON, sometimes to access BBZON internet with wifi alone time when certain times can not, and probably the most common problem for customers is when we use open wifi and web browsing BBZON that we will use often can not, so we had to switch to another web browsing. The drawback of course this affects customer loyalty BBZON. Customer loyalty is very important problem to be considered by companies in marketing. 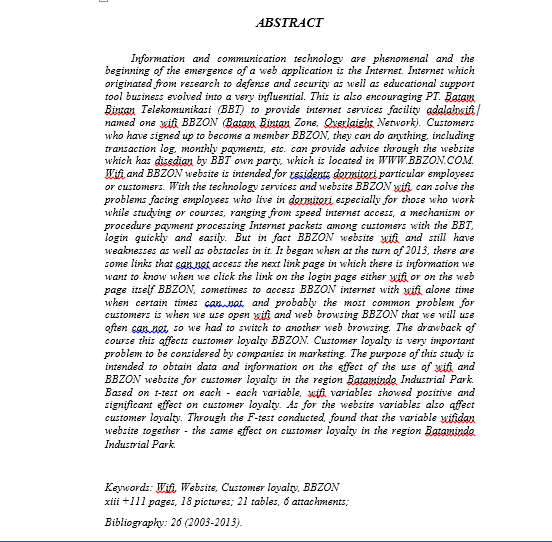 The purpose of this study is intended to obtain data and information on the effect of the use of wifi and BBZON website for customer loyalty in the region Batamindo Industrial Park. Based on t-test on each - each variable, wifi variables showed positive and significant effect on customer loyalty. As for the website variables also affect customer loyalty. Through the F-test conducted, found that the variable wifidan website together - the same effect on customer loyalty in the region Batamindo Industrial Park. 0 Response to "CONTOH ABSTRAK BAHASA INGGRIS TEKNIK INFORMATIKA"